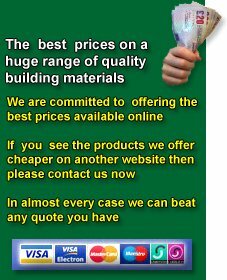 Concrete Blocks , Aircrete Blocks and Lightweight Concrete Blocks are all available from Building Materials Direct some from stock others are special order only. Dense Concrete Blocks are supplied in standard 440mm long x 215mm high x either 75mm , 100mm , 140mm , 200mm and 215mm wide, both the 140mm and 215mm blocks are also available in hollow form. All these sizes of Dense Concrete Blocks and Hollow Concrete Blocks are manufactured in a range of different compressive strengths including 7n/mm2, 10n/mm2 and 20n/mm2 these may be subject to availability and quantity required. 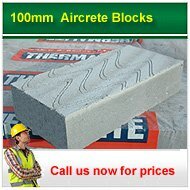 We are suppliers of concrete blocks throughout the country in various quantities. Call our sales office for details. 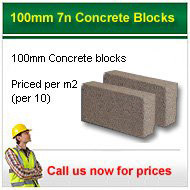 Also available in the Building Materials direct block range are Lightweight Concrete Blocks. Lightweight Concrete Blocks tend to be manufactured from products such as a mixture Furnace Ash and Lightweight Aggregates or expanded clay and Lightweight Aggregates, each manufacturer makes them in their own way but in the end you end up with a block that is slightly lighter than a Dense concrete block with also a better thermal conductivity. These blocks are available in a similar range of sizes to the Dense Concrete Blocks. Building Materials Direct are also suppliers of a Range of Aircrete Blocks from top manufacturers such as Tarmac Topbloc, Celcon Blocks and Hansons Thermalite Blocks. These blocks are very lightweight and thermally efficient, so are ideal for the internal skin of a building or partition walls, being lightweight means that more courses can be laid at a time compared to when using dense Concrete Blocks saving time and money. Thermalite blocks, Toplite or Celcon Blocks come in a much larger range of sizes compared to Concrete Blocks due to there purpose and are generally available in 440mm long x 215mm high x 75mm, 100mm, 125mm, 140mm, 150mm, 190mm and 215mm wide. The compressive strengths also vary due to the general usage of this type of block and the materials they are made of and generally come in 2.9n/mm2 3.6n/mm2 and 7.3n/mm2.